Con You Help Us Out? We here at TOG, love gaming cons... Well at least I (Jeremiah) do. Firestone often sulks from afar because most of the major cons happen states--if not time zones--away. Anyway, while there are some large staples in the gaming con universe: GenCon, Origins, Spiel Con, BGG Con, today we thought we'd make an open place for folks to inform others of the diamonds in the rough. It seems that unless you peruse the bulletin boards at your FLGS you won't hear much about the local cons in your area. So here's where you come in. We'd love to hear from you, especially if you've attended a smaller local con that you think is worth checking out--just let us know down in the comments below. Let us know all the vital details: date, location, any special guests, events, and of course cost for admission. Feel free to include links or twitter accounts, and contact info as well. Remember, this is the internet and our readers are spread out everywhere, so don't hold back--the more cons listed the better! So sound off, gaming folks: Where do you get your con on?! Origins: Going Again. For the First Time. As I wrote last week, Theology Of Games will be covering Origins Game Fair this week. But this certainly isn't the first time I've made the 2-hour pilgrimage to the Con. This year will in fact be my fifth time attending Origins, but it is my first time covering the con as a "reporter." In the past I've only gone for a single day, and usually not even a full day at that. We (we being whichever friend[s] happened to come along that year) usually would head down, buy a day pass at the door, and drool over the cool stuff in the exhibit hall, before making our way to the demo hall to learn even more about the newest and hottest titles. Just making a few rounds in the exhibit hall is worth the trip: tons of new games, demos, and of course a trip down memory lane with some old dead collectible games for sale. Last year, we (this time "we" being Firestone and I) were working in the background to launch TOG, but we didn't go live until July 1. I kept a keen eye on things, took a few pictures, and of course learned a handful of new games, but aside from that it was "just" another trip to Origins. My most memorable trip, though, was the first. This was because my wife and two boys went with me. That's right. My incredible wife spent the day at a gaming convention, with our kids (our youngest wasn't even 1 at the time!) wandering around the exhibit hall while her geeky husband drooled over games, bought a bunch of old collectible card games, and nearly peed himself when he met Peter Mayhew. 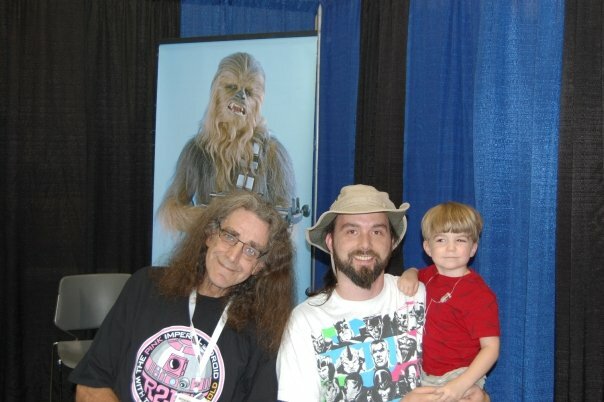 That's right, Peter Mayhew. For those who aren't aware, Mr. Mayhew is known for his portrayal of Chewbacca in the Star Wars films. He had a booth and was selling his autographed photos. He was however gracious enough to take a couple pictures with me and the boys. So this year I'm heading down to actually cover the con for the blog. We've got press passes and everything. Over the past 11 months we've grown our little blog to over 5,000 followers, but more importantly we've connected with gaming industry folks, who are great people, and who also like games as much as we do (if not more!). I'm looking forward to connecting with them, hearing their stories, seeing the product of their passion, and shaking their hands. Firestone and I have big dreams for the blog, and you readers are key to those dreams. Thanks so much for subscribing, reading, sharing, retweeting, and all those other "ing" things you do to support our efforts! And stick around for our first ever con coverage of Origins Game Fair! You can subscribe to our email list over on the right.